Photo by ECHO Asia staff. Much of the content below is drawn from previous ECHO publications available online at www.ECHOcommunity.org. References to these are abbreviated as AN (Asia Notes), EDN (ECHO Development Notes) and TN (Technical Notes). Where possible, website links as of this writing (2016) are provided for references cited. Yearly production of grains, pulses, and vegetables depends on a reliable supply of quality seed. This is true for the farmer growing a crop to feed their family as well as for the agricultural worker evaluating and growing out seeds of a new crop species or variety that could improve lives. In both cases, seeds need to be stored during the interval between the harvesting of one crop and the planting of another. Focusing on the needs of agricultural development workers, there could be multiple reasons for needing to learn more about seed storage. Perhaps seeds or promising crops are brought to a project area, but they cannot be planted immediately. Seeds of valuable, local varieties may need to be stored for future observation trials or to be grown out in anticipation of a community seed exchange event. Proper seed storage techniques can be crucial to maintaining not only the viability of seeds, but also the credibility of agricultural change agents and the ultimate success of a plant introduction. Seeds deteriorate quickly under high heat and humidity. Seasonal variations exist within both dryland and humid tropical regions; however, the humid tropics are especially likely to have extremes in both heat and humidity. At the same time, resources to create ideal storage conditions are limited in many parts of the tropics. Electricity for seed drying, air cooling and de-humidifying storage rooms may be non-existent or erratic. This document outlines practical steps and techniques that can be used to store seeds under such conditions. Figure 1. 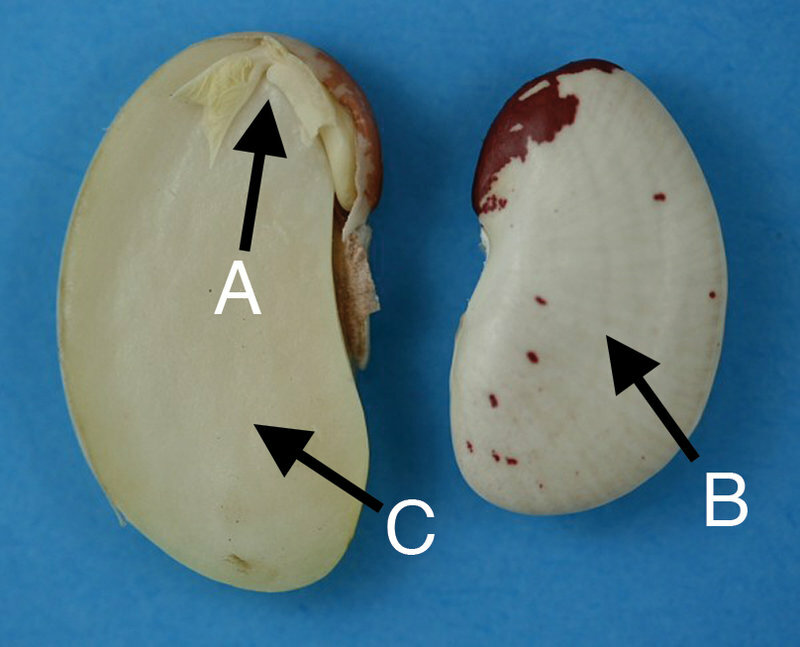 Seed embryo (A), coat/testa (B), and food reserves/cotyledons (C) as shown with a seven-year lima bean (Phaseolus lunatus). A seed contains a living plant embryo supplied with food reserves consisting of fats and oils, starch, and/or protein (Fig. 1). Depending on the crop, these food stores are concentrated in cotyledon (as in legumes/beans) or endosperm (as in grasses such as maize) structures. Surrounding the food reserves and plant embryo is a seed coat. This structure is critical to seed longevity, as it plays a role in gas exchange, affects the rate at which seeds absorb moisture, and protects the embryo and food stores from insects and pathogens. When collecting and storing seeds, it is important to avoid damaging the seed coat and the embryo inside. Up to one year. This is appropriate when seed stocks are refreshed through consistent planting and harvest cycles. One to five years or more. Longer-term storage is needed when collected seeds, for various reasons, cannot be planted during the subsequent growing season. As seed viability varies with crop species, even under ideal conditions, not all seeds will remain viable for over a year. Over 10 years. This type of seed storage is used for long-term conservation of genetic resources, in which seeds are kept under very low moisture and below-freezing temperatures. Equipment and facilities for this are costly and beyond the scope of this document. Ultimately, the best way to preserve seeds and retain biodiversity is for people to regularly plant and harvest them. In most agricultural projects, seeds are continually being distributed/sold and planted out. A Small Farm Resource Center may want to provide farmers with sample amounts of viable seeds over a period of several years. 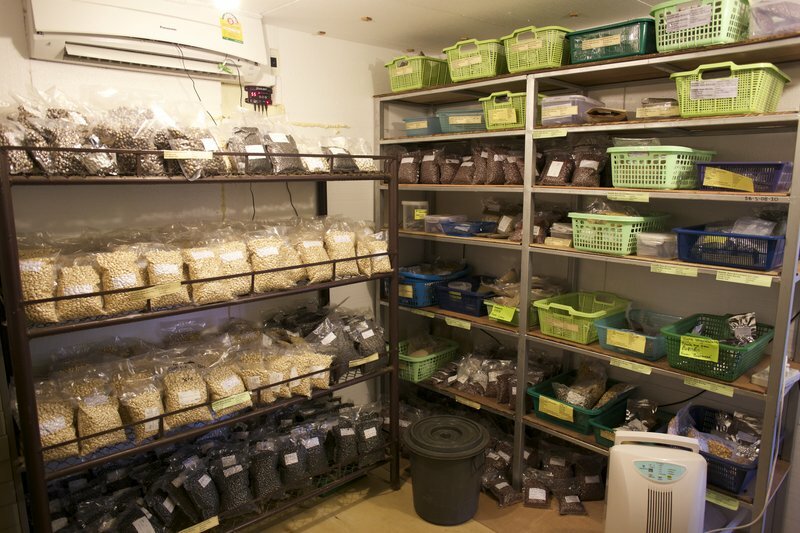 At ECHO seedbanks, seeds are typically stored for one to five years, as seeds are constantly being distributed to end-users. Consequently, the material below pertains to methods for storing seeds for up to 10 years. Seeds are referred to as “orthodox” or “recalcitrant” based on their tolerance to desiccation. Orthodox seeds are those that can be safely dried to a low moisture content (at least 5%) and are best kept under conditions of low moisture and temperature. Cereal grains and most vegetables fall in this category. Most of the practices discussed in this document pertain to orthodox seeds. Recalcitrant seeds are those that will die if they are dried and/or stored for any length of time. They include many of the fruit crops such as mango (Mangifera indica), avocado (Persea americana), and jackfruit (Artocarpus heterophyllus). Seeds of some plants are intermediate in their seed storage behavior. This means they can be stored longer than most recalcitrant seeds but not as long as true orthodox seeds. Neem (Azadirachta indica) seed can be stored for up to about a month, after which germination percentage quickly declines. Carambola (Averrhoa carambola) and papaya (Carica papaya) seeds can be stored successfully under dry but not freezing conditions. Some crops are inherently more long-lived than others. Onion (Allium cepa) seeds, for example, are naturally shortlived. Life expectancies for various vegetables are listed in a document by Lindgren and Browning (2011). Hard, thick seedcoats protect the embryo, and help exclude moisture and oxgyen. This is true of many seeds in the legume family. In contrast, thin-coated seeds are prone to rapid moisture uptake and tissue damage. Though there are exceptions, starchy seeds store longer than oily seeds such as groundnut (Arachis hypogaea). Reasons for this have to do with damage to cell membranes as lipids degrade. The embryo inside a seed is alive and respiring, using oxygen and releasing carbon dioxide as food stores are converted into energy. When storing seeds, the aim is to greatly slow the rate of respiration. Doing so ensures that the plant embryo stays alive over a longer period of time and that, when the seeds are taken out of storage and planted, there are still plenty of food reserves to support rapid seedling growth. Factors that affect respiration and overall metabolism of seeds include oxygen levels, air temperature, and seed moisture content. High heat and humidity in particular will shorten the longevity of seeds by speeding up respiration and potentially causing seeds to rot. Seeds are best kept under cool, dry conditions with low oxygen (EDN 86). Low oxygen content has also been linked with reducing free radicals (unstable molecules), which damage living seed tissue. Figure 2. Caterpillar boring into the seed pod of a legume. Source: ECHO staff. Cowpea bruchids (Callosobruchus spp. ), bean bruchids (Acanthoscelides obtectus), larger grain borers (Prostephanus truncatus), lesser grain borers (Rhiopertha dominica), and grain weevils (Sitophilus spp.) are all examples of insect pests that adversely affect stored seeds as larvae feed on the inner kernels. Diseases that affect and are spread by seeds include anthracnose (Colletotrichum spp. ), leaf and pod spot (Ascochyta phaseolorum), fusarium wilt (Fusarium oxysporum), mosaic viruses, and bacterial blight (Xanthomonas spp.) The Online Information Service for Non-Chemical Pest Management in the Tropics (OISAT) has photos and information on a number of pests and diseases. IPM (Integrated Pest Management) principles for early pest detection and appropriate response. A push-pull approach, making use of repellent and trap crops to reduce insect pests in the field (ICIPE). Scheduling of seeding or transplanting activities so that flowering occurs during a dry time of year. This reduces maturing seeds’ exposure to humidity and disease pressure. Removal of diseased or stunted plants from seed grow-out plots before they set seed. Removal of weeds that host specific pests. Harvesting seed as early as possible as it matures. Timely harvests minimize seeds’ exposure to pests in the field. Responsible use of insecticides, recognizing issues of safety and the importance of preserving beneficial insects. Insecticidal soaps or botanical sprays (e.g., neem or tephrosia [Tephrosia vogelii]) have been used with varying success. Techniques for cleaning seed depend on the crop. Seeds of fleshy fruits are wet when removed from the fruit. Other seeds are dry when mature, including many grain legumes such as cowpea (Vigna unguiculata) and lablab (Lablab purpureus). Figure 3. Fermentation of tomato seeds. For fleshy fruits, cut the mature fruit open and rinse the seeds with water or lightly rub them against a screen to remove the pulp. Fermentation works well for fruits in which the pulp is not easily removed from the seed (e.g. tomatoes). This involves squeezing the seeds—together with the pulp—into a container placed in a warm (24 to 29°C; 75 to 85°F) location (Fig. 3). A white mold develops that then breaks down the gel surrounding the seeds. After one to four days, when the mold has mostly covered the pulp, pour the contents of the container into a sieve or onto a screen and rinse with water. The cleaned seeds can be placed on a cloth or paper towel to dry. Fermentation reduces the risk of seed-transmission of plant diseases (Hopkins 1996; Lovic and Hopkins 2003) and works well for cleaning seeds of tomato (Lycopersicon esculentum), cucumbers (Cucumis sativis) and passion fruit (Passiflora edulis). Other seeds (e.g. papaya) with pulp attached can be scooped out, mixed with sand, rubbed with sand, and rinsed with water in a fine mesh screen. The sand scours the pulp from the seeds and is flushed away with water, leaving the seeds in the screen. After harvesting dry seeds, be sure to remove dirt, plant debris, and weed seeds. Cereal grains or bean crops are threshed or shelled to separate seed kernels from seed heads, cobs or pods. Winnowing (using wind or a fan) or screening separates the seed from unwanted debris. Whether these activities are done by hand or machine, take care not to damage the protective seed coat. In carrying out the above-mentioned cleaning practices, many insects are also removed. Figure 4. Seed drying cabinet at ECHO. The top chamber (A) contains a heat source (A-1; incandescent light bulbs) and a fan (A-2). Air enters from the top chamber (intake not shown) and is directed by the fan, as indicated by the green arrows, into a channel on the right side of the cabinet that opens up at the bottom of the cabinet to allow the air to circulate around and through the screened shelves (B). An optional thermostat (C) turns the heat source off and on as needed to prevent overheating. Air also circulates back up to the top chamber as it passes through a dust filter (the blue strip of foam at the bottom of the top chamber). It is possible to incorporate a valve or diverter into the air intake to control how much air is exhausted (to remove humidity) versus recirculated (to warm the air). Seeds with a high moisture content do not remain viable for long periods of time and may even germinate prematurely or rot in storage. Consequently, seeds with a high moisture content (e.g., over 10%) need to be dried before being placed in storage. This could be true for recently-harvested seeds that are mature but still moist because of humid conditions in the field. The simplest option is to dry seeds naturally in the outdoors. This works best for seeds that are already nearly dry. Seeds dried outdoors need protection from animals and rain. 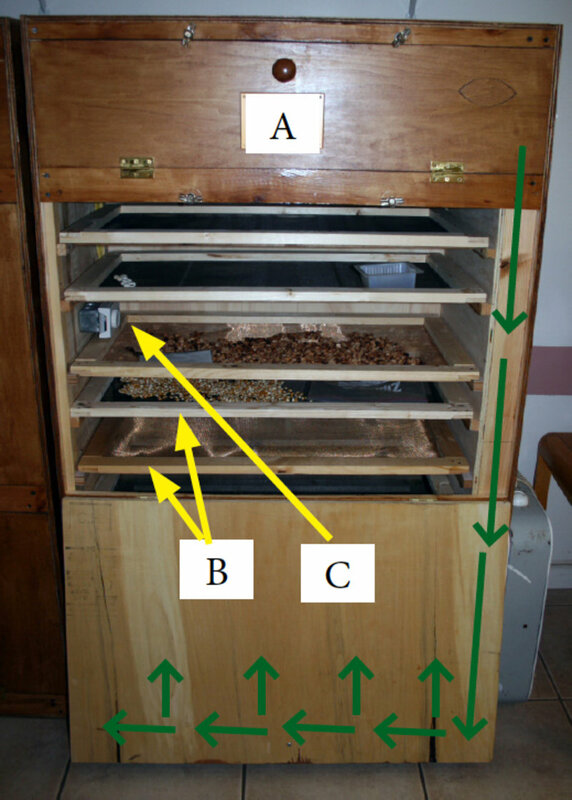 If rain or humidity is an issue, and electricity is available, seeds can also be dried artificially on racks in a temperature-controlled cabinet (Fig. 4) or room. Regardless of how the seeds are dried, do not expose them to high temperatures. Seed tolerance to heat depends on the crop, seed moisture content, and drying time. However, a general guideline is to keep drying temperatures below about 40°C (110°F) (Silva 1998; FAO 1994); seeds of cereal grains can withstand slightly higher temperatures. If drying seeds outside, overheating can be avoided by drying seeds in a shaded location. Good air circulation is also important, as this helps prevent mold from developing during the drying process. Harvested seeds at ECHO are normally dried in a seed-drying cabinet for one to three days at or slightly less than 38°C (100°F). Our cabinets are equipped with a heat source (can be as simple as a few incandescent light bulbs), a thermostat to ensure the temperatures do not become fatal, one or two fans to circulate air, and a place for fresh air to be brought in while also exhausting humid air outside the cabinet. After harvested seeds have been cleaned and dried, they need to be stored in a dry environment so they do not rehydrate. Ideally, seed moisture content should be kept between 3% and 8%. This can be difficult to attain in the tropics, but it gives an optimum to strive for. To avoid having to destroy (through oven-drying) a sample of seeds, one can instead check tables developed to show what the seed moisture content will be based on percent relative humidity (see chapter 3 of Procedures for Handling Seeds in Genebanks (Hanson 1985). Tables for numerous other crops are found on pages 40-44 of Principles and Practices of Seed Storage (Justice and Bass 1978). An online seed moisture calculator for numerous crops is also provided by Kew Royal Botanic Gardens. Therefore, if the temperature of a storage facility is 80°F, the ideal humidity to strive for is 20% (80 + 20 = 100). However, humidity is the most important factor due to its impact on seed moisture content. This is because, as humidity approaches 70%, seed moisture content increases to approximately 13%, at which point higher seed respiration rates and storage fungi become significant problems (McCormack 2004; Justice and Bass 1978). How does one maintain a batch of seeds under dry enough conditions? This question is especially important during the rainy season when, in many parts of the tropics, relative humidity can reach well above the 65% to 70% threshold at which mold can grow. If electricity is available and reliable, (a) dehumidifier(s) can do a good job of keeping a storage room dry. This was done for many years at ECHO’s seedbank in Florida to control humidity in a shipping container adapted for use as a storage facility. Anything that absorbs water will help reduce humidity in an enclosed space. The “For Further Reading” section at the end of this document provides sources to information on desiccant options. Figure 5. 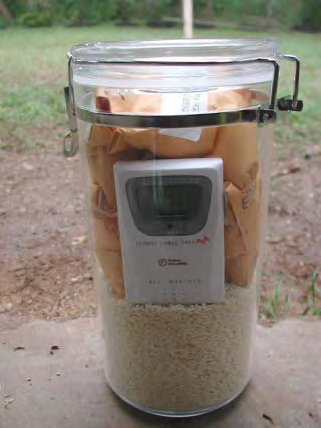 Dried rice in a sealed container of seeds with a wireless hygrometer (to monitor humidity). Rice is highlighted here because it is widely available. We have found that, with rice as a desiccant in sealed containers, it is possible to reach humidity levels as low as 20%. It is critical to heat the rice, just prior to placing it in a container, to drive off existing moisture. This can be done in an oven (e.g., spread rice out on a tray placed in the middle rack for an hour at about 150°C [300°F]) or even in a pan over an open flame (see video by Seth Morgan  called Parched Rice Desiccant). Once the rice kernels are lightly browned or stop losing weight, place them in the container(s) to be used for storing seeds. Drying to a constant weight is the best way to be sure that the rice is completely dry. To do this, take the rice out of the oven every 15 minutes or so, weigh it, put it back in the oven and repeat the process until there is no more weight loss. Allow the container to cool for about 20 minutes before placing seeds into it. A good starting point, in terms of volume of rice, is to fill a container 1/4 of the way full with heated rice. To maintain the effectiveness of the rice, keep the container closed/sealed; also close it again right away after removing seeds. A small amount of salt—placed in a small container (with holes in the lid) within the container of seed—can serve as an indicator of how well the rice is working over time; if the salt crystals clump together, then the rice is likely no longer able to absorb moisture from the air and needs to be replenished. Alternatively, a wireless hygrometer can be used to monitor humidity inside a container. Where ambient humidity is high, and electricity is not available for running a dehumidifier, seeds are best kept in moisture-proof containers along with a desiccant. In this way, surrounding moisture from the storage room/facility is excluded, and existing humidity in the closed container is absorbed by the desiccant. Plastic or glass bottles are often used to store small amounts of seed. A plastic liner or bag is a good idea inside glass jars, in case of glass breakage. Ziploc™ bags can work, but use thicker plastic than that used for sandwich bags. Plastic bags work best for smooth seeds with no sharp edges or spines that can pierce holes through the plastic. Avoid using porous containers such as paper envelopes or cardboard in humid environments. In a continuously dry climate, moisture-proof containers and desiccants are perhaps not needed. In monsoon regions, where humidity fluctuates widely between rainy and dry seasons, sealed containers and desiccants can keep seeds dry all year long. Figure 6. Bicycle tire pump modified for vacuum sealing. Vacuum sealing helps keep seed moisture content low by minimizing exposure to ambient humidity. It also minimizes oxygen presence, slowing seed respiration, reducing damaging free radicals, and thereby increasing the longevity of seeds in storage. It could be utilized alone or in combination with a desiccant. Seeds can be subjected to vacuum using technology as simple as a bicycle tire pump (EDN 126). Key elements of a design used successfully by ECHO staff in Asia involve 1) reversing the bicycle pump piston and valves, 2) utilizing a tire stem with a reversed valve to ensure that evacuated air does not seep back into the jar while pumping, and 3) using a PVC cap with gasket to ensure that a tight, leak-free seal is created on the lid of the jar while evacuating the air from it. 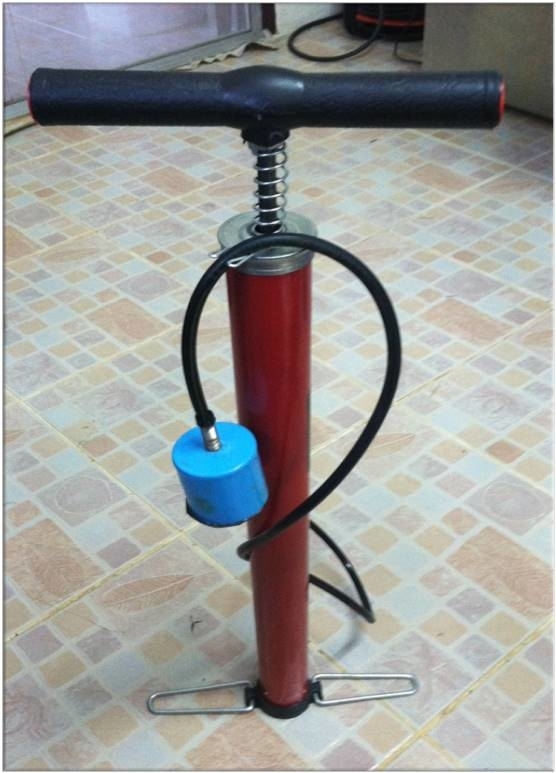 Details for modifying a bicycle tire pump to draw a vacuum on a container of seeds are available through a PowerPoint presentation. At ECHO’s seedbank in Asia, a jar of lablab (Lablab purpureus) seeds was vacuum sealed using the pump described above. One year later, these seeds had a moisture content of 10.3% and a germination rate of 97%, resulting in similar viability (i.e. capacity for growth after storage) as seeds subjected to vacuum using an expensive, commercial vacuum sealer. By comparison, lablab seeds in paper bags on the floor of a humid, earth-walled structure deteriorated due to fungi and pathogens. Vacuum sealing also helps to control insects in stored seeds (AN 14; Chiu et al. 2003; Croft et al. 2013;). Insects or insect eggs can be present that were not found during cleaning activities. They are killed as a result of reduced oxygen in the container (Chiappini et al. 2009; Shivaraja et al. 2013). Seeds themselves slowly use oxygen and release carbon dioxide, so complete filling of containers with seeds likely helps to deplete oxygen levels below the 3% to 5% minimum threshold that insects need to survive. Where electricity or other energy sources are available, mechanical refrigeration is the most reliable way to keep seeds cool. Possibilities range from ordinary refrigerators or air-conditioning units to walk-in cooling systems. Standard window unit air conditioners are not set up to operate at temperatures much under 16°C (60°F). They can be made, however, to run as cool as 2°C (35°F) through the use of a CoolBot. Priced at approximately 315 USD per unit, the CoolBot is a much cheaper alternative to a walk-in cooling unit. Where there is no electricity, it is possible to store seeds below ground, in well-insulated structures, or in the coolest part of a building that does not receive sunlight. These are all ways to avoid subjecting seeds to large changes between day and night-time temperatures. Regardless of how a storage space is cooled, make sure the humidity around the seeds is kept low. It is fine to keep seeds in a household refrigerator as long as they are in an airtight container with some desiccant to keep them dry. Even without mechanical cooling capabilities, seeds can be stored for years by excluding moisture and thereby following the above-mentioned “100-rule” as closely as possible. It is critical to test seed viability on a regular basis. The credibility of a development worker or agency can be unnecessarily undermined if the seeds they promote germinate poorly (TN 39). Germination tests are the most common way to measure seed viability; ECHO seedbanks conduct germination tests at least once a year for each batch of seeds. Accurate results for a germination test depend on obtaining a seed sample that is typical (representative) of the entire bag or container of seeds. The larger the number of seeds tested, the more accurate the test will be. Considering the limited number of seeds that we have, ECHO seedbank staff typically plant 20 seeds per sample. Greater certainty can be achieved, though, with germination tests based on more (e.g., 100) seeds. A clean working area is important to reduce contamination and false results. A germination test involves recording the number of seeds that germinate over a pre-selected time interval, depending on how long seeds of that crop typically take to germinate. Then, once it is clear that no more seeds are going to germinate, you can calculate the percentage that have germinated based on the number of seeds originally planted. Figure 7. Seed germination cabinet. Soak the sample of seeds in 10% bleach for two minutes (you can go longer for larger seeds like moringa, cucurbits, and beans), drain, and rinse with water. Distribute the seeds onto a clean damp paper or cloth towel. Carefully roll the towel into a long cylinder and store it in a warm damp place. It works nicely to place the rolls in a tray that also contains a bowl of water; then enclose the tray and its contents in a plastic bag. Be careful to place the bag somewhere out of direct sunlight, or the contents will overheat. Instead of using a tray to store the rolls, you could use glasses; place one end of an individual roll in a glass containing a small amount of water. Be sure to label each glass/roll. For small seeds, an alternate method is to use petri dishes, with seeds placed on top of moistened laboratory or coffee filter paper. Seed germination tests will be most accurate if you can reduce uncontrolled variance (e.g., fluctuating temperature, irregular watering, fungal spores, etc.). 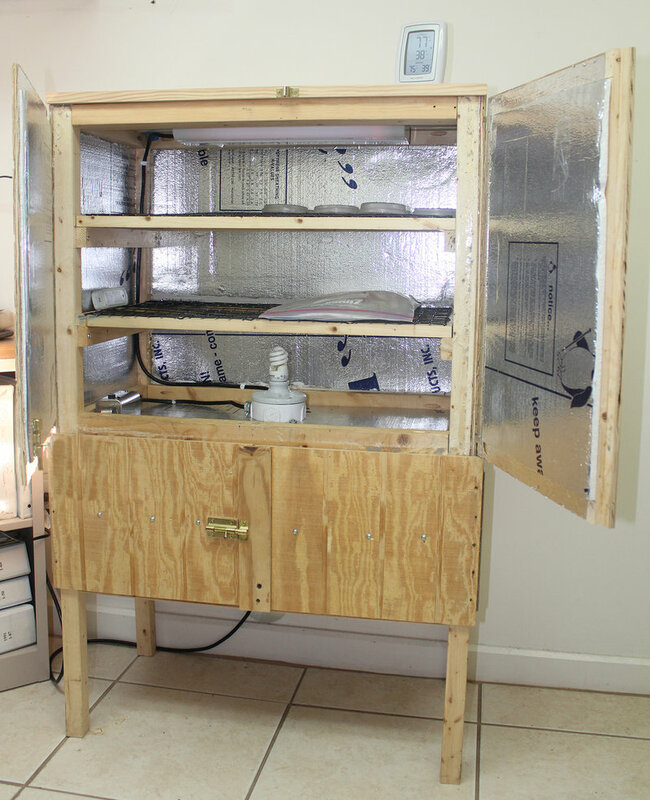 Dr. Abram Bicksler, at the ECHO Asia Seedbank, modified an inexpensive metal kitchen cabinet with foam (for insulation) and lights (incandescent for heat and/ or fluorescent for light) to create a dedicated seed germination chamber in which proper temperatures and relative humidity for germinating seeds can be maintained. Based on Bicksler’s design, a similar cabinet was built at ECHO’s seedbank in Florida (Fig. 7). Seeds can be germinated using either the petri dish or ragdoll methods, and the cabinet is large enough to conduct small-scale experiments. Additionally, the cabinet is modular, and can be utilized for seed and plant material drying in addition to seed germination. Timers or thermostats can be used in conjunction with light and heat sources to give a greater degree of control over germination conditions. It is also possible to use soil, a good approach for species that take over ten days to germinate. With these species, mold can become a factor when testing in petri dishes or paper towels. A germination test in soil also has the benefit of providing information about seed vigor; after all, a seed may germinate but not necessarily have sufficient vigor to push through the soil and produce a healthy seedling. At ECHO, we use plastic plug trays with one seed planted per planting cell. Egg cartons or other clean containers may be used if plastic plug trays are unavailable. Storing seeds for any length of time in the tropics can be difficult without reliable electricity for cooling and drying. However, existing practical and relatively inexpensive technologies and practices can be used by development workers, seedbanks, or enterprising farmers. Before selecting which practices and technologies to implement, consider the principles discussed in this document, as well as local conditions and constraints. We invite you to utilize www.ECHOcommunity. org as a way to contribute to an ever-growing ECHO knowledge base in the area of seed storage. Chiappini, E., P. Molinari, and P. Cravedi. 2009. Mortality of Tribolium confusum J. du Val (Coleoptera: Tenebrionidae) in controlled atmospheres at different oxygen percentages. Journal of Stored Products Research 45:10-13. Chiu, K.Y., C.L. Chen, and J.M. Sung. 2003. Partial vacuum storage improves the longevity of primed sh-2 sweet corn seeds. Scientia Horticulturae 98:99-111. Croft, M., A. Bicksler, J. Manson, and R. Burnette. 2013. Comparison of Appropriate Tropical Seed Storage Techniques for Germplasm Conservation in Mountainous Sub-Tropical Climates with Resource Constraints. Experimental Agriculture 49:279-294. Food and Agriculture Organization (FAO). 1985. A Guide to Forest Seed Handling. Food and Agriculture Organization (FAO). 1994. Grain storage techniques: Evolution and trends in developing countries. Hanson, J. 1985. Procedures for Handling Seeds in Genebanks. Practical Manuals for Genebanks: No. 1. Rome, Italy: International Board for Plant Genetic Resources. 115 pp. Harrington, J.F. 1972. Seed storage and longevity. In T.T. Kozlowski, (Ed) Seed Biology, Vol 3 pp. 145-245 Academic Press, Inc., New York. Hopkins, D.L. 1996. Wet Seed Treatments for the Control of Bacterial Fruit Blotch of Watermelon. Plant Disease 80:529- 532. Justice, O.L., L.N. Bass, and United States Science and Education Administration. 1978. Principles and Practices of Seed Storage. United States Department of Agriculture, Science and Education Administration. Agriculture Handbook No. 506. Lindgren, D.T. and S.J. Browning. 2011. Vegetable Garden Seed Storage and Germination Requirements. University of Nebraska-Lincoln Extension. Lovic, R.B. and D.L. Hopkins. 2003. Production Steps to Reduce Seed Contamination by Pathogens of Cucurbits. Hort-Technology 13:50-54. McDonald, M.B. and L.O. Copeland. 1997. “Drying and Storage,” in Chapter 7 of Seed Production Principles and Practices. Springer Science+Business Media Dodrecht. McCormack, J.H. 2004. Seed Processing and Storage: Principles and practices of seed harvesting, processing, and storage: an organic seed production manual for seed growers in the Mid-Atlantic and Southern U.S. Carolina Farm Stewardship Association. Online Information Service for Non-Chemical Pest Management in the Tropics (OISAT). Shivaraja, D.B., J. Mekali, A. Naganagoud, A.G. Sreenivas, and M. Kapasi. Studies on the effect of O2 and CO2 gases at different concentrations on the development of pulse beetle Callasobruchus analis (Fabricius) (Coleoptera: Bruchidae in chickpea. Journal of Biopesticides 6:63-67. Silva, W.R. 1998. Seed Performance after Exposure to High Temperatures. Scientia Agricola 55:102–9. A web page by Crop Genebank Knowledge Base contains links to a series of handbooks, manuals and technical bulletins on principles and practices for storing seeds. Seed moisture and viability prediction tools by Kew Royal Botanic Gardens. Quentin, M.E., J.L. Spencer, and J.R. Miller. 1991. 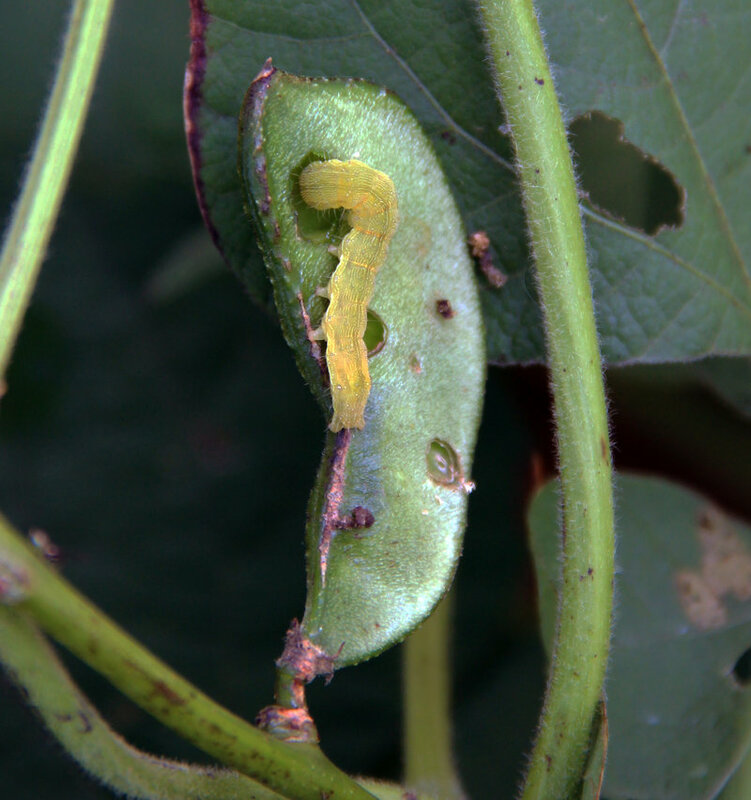 Bean tumbling as a control measure for the common bean weevil, Acanthoscelides obtectus. Entomologia Experimentalis et Applicata 60:105-109. Silica Gel: Yoshinaga, A. 2010. Guidelines for Successful Seed Storage. Center for Conservation Research and Training. Drying beads (with contact info for Rhino Research Group, a distributor in Thailand): Simple and Effective Drying and Storage of Seeds and Horticultural Products for Developing World Farmers. HortCRSP/USAID. Morgan, S. 2013. Parched Rice Desiccant. An ECHO video on heating brown rice over an open flame.